This paper provides a side-by-side comparison of the long-run growth and revenue effects of the cost recovery systems in the Baucus proposal, the Camp plan, the Wyden-Coats proposal, and full expensing. 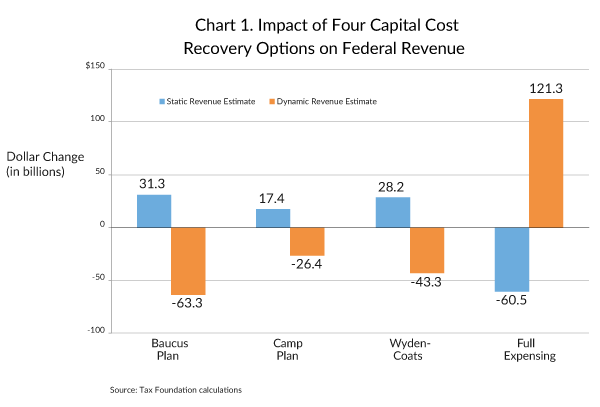 The cost recovery proposals of Baucus, Camp, and Wyden would lengthen asset lives and score as increases in federal revenue on a static basis. However, when accounting for economic growth, each proposal would actually lose revenue in the long run due to lower growth. Lengthening the lives of capital assets worsens the anti-investment bias in the tax code and leads to lower investment, lower productivity, lower wages, and slower economic growth. The Baucus cost recovery system would decrease GDP by 2.53 percent, the capital stock by 7.08 percent, wages by 2.16 percent, jobs by 449,500, and federal revenues $63.3 billion after accounting for growth effects (compared to an estimated increase of $31.3 billion on a static basis). The Camp cost recovery system would decrease GDP by 1.18 percent, the capital stock by 3.35 percent, wages by 1.01 percent, jobs by 206,000, and federal revenue by $26.4 billion (compared to an estimated increase of $17.4 billion on a static basis). The Wyden cost recovery system would decrease GDP by 1.91 percent, the capital stock by 5.39 percent, wages by 1.64 percent, jobs by 338,100, and federal revenue by $43.3 billion (compared to an estimated increase of $28.2 billion on a static basis). Full expensing would increase GDP by 5.13 percent, lift the capital stock by 15.4 percent, raise wages by 4.36 percent, create 885,300 jobs, and boost federal revenue by $121.3 billion (compared to an estimated decrease of $60.5 billion on a static basis). There are two directions tax reform proposals could go with regard to the tax treatment of investment costs. In one direction, Congress could shorten the time that businesses must wait between when they spend money on equipment, structures, and other depreciable capital assets and when they can write off those expenses on their tax returns. Congress took this route with the Guideline Lives in the Kennedy tax cut in 1962, the shift to the Asset Depreciation Range System (ADR) in 1971, and in the first Reagan tax cut in 1981, which included the Accelerated Cost Recovery System (ACRS) for equipment and which also shortened lives for structures. More recently, Congress went down this path with bonus expensing, which it first enacted on a temporary basis shortly after September 11, 2001 and reauthorized several times since. Congress also chose this approach with Section 179 expensing for small businesses, which was first enacted in 1958. At the end of 2013, however, the bonus expensing provision expired, and limitations on Section 179 expensing reverted to much smaller, decade-old levels. In the other direction, Congress could lengthen the delay between when businesses incur capital costs and when the government permits them to recognize those costs for tax purposes. It did so in the Tax Reform Act of 1986, switching from ACRS to the Modified Accelerated Cost Recovery System (MACRS) and lengthening lives for structures. Over the last several years, three major tax proposals have gone down the second path. One was released by former senator Max Baucus (D-MT) when he was chairman of the Senate Finance Committee. The other was developed by Representative Dave Camp (R-MI), chairman of the House Ways and Means Committee. Senator Ron Wyden (D-OR), the new chairman of the Senate Finance Committee, also took this approach. He introduced tax reform legislation on a bipartisan basis with Senator Judd Gregg (R-NH) in 2010, and he reintroduced almost the same proposal with Senator Dan Coats (R-IN) in 2011. All three plans would dramatically cut individual and corporate income tax rates but impose much slower capital cost recovery schedules as one of the larger revenue offsets. In all three plans, the longer capital cost recovery periods are scored as revenue raisers. An earlier Tax Foundation study described Senator Baucus’s cost recovery proposal and estimated its long-term growth and revenue effects. A more recent study examines the economic and revenue consequences if the domestic portion of Chairman Camp’s plan, which contains many provisions including a redesigned cost recovery system, were to become law. The aim of this paper is to provide side-by-side comparisons against current law of the long-run growth and revenue effects of the cost recovery systems in the Baucus proposal, the Camp plan, the Wyden-Coats proposal, and, going in the other direction, a move to full expensing (immediate write-off) of investment costs for all assets, including equipment, plant, and commercial and residential structures. The Baucus, Camp, and Wyden-Coats proposals are all extremely detailed and contain many provisions bearing on capital cost recovery allowances in special cases. This analysis concentrates on the general cost-recovery provision affecting the bulk of depreciable assets in each plan. The different capital cost recovery systems were simulated using the Tax Foundation’s Taxes and Growth model (TAG model). The TAG model was initially run under the artificial constraint of no growth effects to produce conventional revenue estimates. In the long run, and disregarding growth effects, the Baucus system would allegedly raise $31.3 billion annually, the Camp system would be scored as collecting $17.4 billion annually, the Wyden-Coats provision would be scored as collecting $28.2 billion annually. Full expensing would allegedly cost the U.S. Treasury $60.5 billion annually. The static revenue estimates highlight one of the main barriers to adopting full expensing: it appears to have a high revenue cost for the federal government. These results can be seen in Chart 1 and Table 1. These numbers explain one of the main attractions of slower depreciation to would-be tax reformers: Stretched out cost recovery schedules look like potent revenue raisers if growth effects are not considered. The money these longer recovery schedules would theoretically collect could be used to finance other, money-losing tax changes, for deficit reduction, or for new government spending. The capital cost recovery system in the Camp proposal strikes a middle ground between current law and the Baucus plan. It would delay write-offs compared to the schedule in current law (MACRS) but its delays would not be as long as those in the Baucus plan. Chairman Camp pledged that his package would be revenue neutral on a static basis, and he is clearly using the assumed money from his capital cost recovery proposal to help accomplish that. Camp begins with a slightly modified version of the Alternative Depreciation System (ADS), which has long tax depreciation periods and uses the straight line depreciation method. An innovative feature of the Camp proposal is that it would, relative to ADS, shorten the write-off schedule for equipment as the inflation rate heats up. This would provide some protection against inflation’s erosion of the real value of delayed cost recovery allowances, but it stops far short of full inflation indexing for equipment write-offs and would not cover structures at all. The cost recovery system in the Wyden-Coats bill is similar to Chairman Camp’s but lacks the inflation adjustment. The TAG model was next rerun without imposing the false assumption that taxes cannot affect the size of the economic pie. As Chart 1 and Table 1 show, the picture changes completely when federal revenue estimates include growth effects. Because of the economic damage it would do, the model estimates that the Baucus plan’s capital cost recovery system would lower federal revenue by $63.3 billion annually in the long run. The model estimates that the stretched out write-off schedule in the Camp plan would also be harmful, reducing growth and diminishing federal revenue by $26.4 billion annually in the long run. Commendably, Chairman Camp instructed the JCT to prepare a dynamic revenue estimate for his plan. The JCT did not release a dynamic estimate for the cost recovery provision by itself but predicts that Chairman Camp’s overall plan would “increase revenues relative to the conventional revenue estimate by $50 to $700 billion, depending on which modeling assumptions are used, over the 10-year budget period.” However, not all of this revenue swing should be attributed to additional domestic growth. A large portion is apparently due to a presumed shift in reported business income to the United States from abroad as a result of the Camp plan’s lower corporate tax rate. The cost recovery system in the Wyden-Coats bill would also lower growth. The model estimates that because of its large, negative economic feedback, it would cut federal revenue by $43.3 billion yearly in the long run, which is better than Senator Baucus’s proposal but worse than Chairman Camp’s. The reason the Camp proposal scores the best of the three is its partial inflation adjustment. Although the inflation adjustment falls far short of proper indexing, it is much better for the economy than no indexing. Meanwhile, economic growth would transform full expensing into a revenue raiser, with an estimated revenue gain of over $120 billion annually in the long run. Equipment, structures, and other depreciable capital assets are tools that enhance productivity. Tax policy influences the amount of capital investment people undertake and thereby affects economic growth, because the amount of capital people wish to hold is extremely sensitive to the expected after-tax rate of return. The service price of capital (or the hurdle rate) is the before-tax rate of return a potential buyer of a capital asset requires in order to cover taxes, depreciation, inflation, and risk and still earn a satisfactory real, after-tax return. (Excluding depreciation, the rate is called the “cost of capital.”) A tax depreciation system that does not let investors deduct capital expenditures from income when incurred raises the service price—and creates an anti-investment bias—because the delay shortchanges the investor in present value terms. As a simplified example, if a business purchases a machine for $100 today but must write off the machine on a straight line basis over five years and if the discount rate is 5 percent, the present value of the write-off is only $90.92, which understates the true cost and exaggerates taxable income by over $9 in present value terms. To compensate for the tax bias, the business will demand a higher pre-tax return on the investment, which means it will invest less and forgo some projects it would otherwise undertake. Further, because the decline in investment will hurt productivity and people earn wages based on their productivity, much of the pain will ultimately fall on labor.The capital cost recovery system in current law is called the Modified Accelerated Capital Cost Recovery system (MACRS). Although “accelerated” is part of its name, MACRS requires stretched-out write-offs. By delaying when investors can deduct costs, MACRS creates an anti-investment bias that pushes up the cost of capital, diminishes capital formation, and, as a result, slows growth. The Baucus proposal would stretch out tax write-offs much more than does MACRS. That has the advantage of yielding a large static revenue estimate, but it has the disadvantage of sharply intensifying the tax system’s anti-investment, anti-growth biases. The reduced growth is the reason why the cost recovery provision in the Baucus proposal yields such a disappointing dynamic revenue estimate. As depicted in Chart 2 and Table 1, the model estimates that the capital cost recovery provision in the Baucus plan would raise the service price of capital by 4.8 percent, leading to long-run drops in the capital stock by 7.1 percent, employment by 0.5 percent, and GDP by 2.5 percent. The materials accompanying the Baucus proposal claim the new schedules make good economic sense, because they approximate what is called economic depreciation. Economic depreciation attempts to synchronize tax write-offs with the rate at which assets decline in value. Unfortunately, matching tax write-offs with economic depreciation is neither practical nor desirable. The practical difficulty is that the rate at which an asset loses economic value depends on a huge number of factors, many of which are asset and firm specific and many of which are not known in advance. To take a humble example, the rate at which an office desk declines in value depends on the sturdiness of its construction, whether it is ergonomically designed, who in the office uses it, how it is used, the layout of the office, whether the business is expanding or contracting, and numerous other factors. It is simply not possible for members of Congress and tax enforcers to write laws and regulations that accurately reflect year-by-year changes in the value of each specific depreciable asset across thousands of asset types and millions of businesses. Even if practicality is ignored, economic depreciation would not be good economic policy. Because it does not let a business deduct on its tax return the cost of a depreciable asset in the year the cost is incurred, but instead requires multi-year write-offs, the present value of the write-offs understates the asset’s actual cost. As discussed above, the delay exaggerates net income in present value terms and creates a tax bias against investment. The bias leads to less capital formation, smaller gains in productivity, and slower growth in the U.S. economy. As noted earlier, the capital cost recovery system in Chairman Camp’s draft proposal would delay capital cost write-offs more than current law but less than the Baucus proposal. The TAG model’s estimates reflect that. It predicts that the service price of capital would rise by 2.2 percent, causing declines of 3.4 percent in the capital stock, 0.2 percent in employment, and 1.2 percent in GDP. To be clear, these numbers refer only to the Camp plan’s capital cost recovery provision. Many other features in the plan are pro-growth, and the Tax Foundation model estimates that, on net, the domestic portion of the Camp plan would boost long-term growth by 0.2 percent. 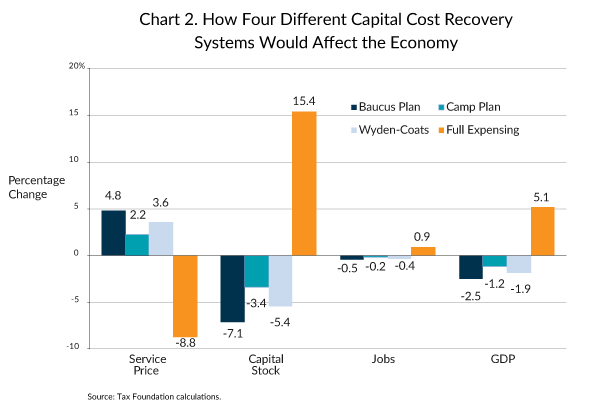 Our TAG model estimates that the capital cost recovery system in the Wyden-Coats bill, which is similar to that in the Camp plan except for the lack of any inflation adjustment, would increase the service price of capital by 3.6 percent, triggering long-run reductions of 5.4 percent in the capital stock, 0.35 percent in employment, and 1.9 percent in GDP. Expensing, in contrast, would substantially lower the cost of capital because it would not inflict a tax bias on new investment. The model estimates that full expensing would slash the service price of capital by 8.8 percent, leading to a 15.4 percent larger capital stock than under current law, lifting employment by 0.9 percent, and growing the economy by 5.1 percent. The larger economic pie and higher incomes would bolster collections from a variety of federal taxes and fees. The model predicts the response would be sufficiently robust that, as illustrated in Chart 1, it would transform a static revenue loss into a dynamic revenue gain. Many tax reductions would help the economy, but a shortening of cost recovery periods is one of the few that would pay for itself from the perspective of the U.S. Treasury. Three others are cutting the corporate tax rate, which is now higher than that in any other developed nation, lowering the tax rate on capital gains and dividends, and reducing or eliminating the estate tax. A common feature of these reforms is that they focus on investment, which is vital in modern production and responds powerfully to expected after-tax returns. Because faster write-offs would be self-financing, there is no economic need to condition them on finding revenue offsets. It would be desirable to shorten write-off periods immediately. If a “pay for” is nevertheless demanded, a good option would be to trim low-value government spending. According to the model’s results, full expensing would have a long-run, annual static revenue tab of $60.5 billion but generate $836.5 billion in added GDP. Surely, with federal spending now exceeding $3.6 trillion, it is possible to identify $60.5 billion of outlays that have an economic value of less than $836.5 billion. As a result of political pressures, however, a move toward longer write-off periods is sometimes viewed as the price of achieving other reforms. It may be possible for the overall package to be pro-growth, but only if the package’s other elements are extremely beneficial. As mentioned previously, the Tax Foundation’s TAG model estimated that Chairman Camp’s initiative would raise GDP by 0.2 percent in the long run. That is in positive territory. If the plan could have kept current-law cost recovery schedules, though, the estimated GDP gain would have been 1.3 percent. With shorter write-off periods, the gain would be even greater. The Tax Foundation’s Taxes and Growth model is an incentive-driven model of the real economy. People decide how much to work and invest based in part on the after-tax rewards they receive for working and investing. If marginal tax rates change, incentives shift and people respond. Lower marginal tax rates lift after-tax rewards. That encourages people to supply more labor and capital in production, and output rises. Conversely, higher marginal tax rates discourage productive efforts, leading to less output. The model is long run, estimating the changes after people have had time to adjust their work effort and the quantities of equipment and structures to the new incentives. This is integrated with an individual income tax calculator that draws on data from an anonymous sample of almost 140,000 tax records (the IRS 2008 Public Use File). The model generates estimates of the positive or negative growth effects of tax changes. In addition, it provides dynamic revenue estimates that take into account growth feedbacks. The revenue numbers are in contrast to conventional revenue estimates, which make the simplifying but sometimes misleading assumption that tax changes do not affect the total size of the economic pie. When tax changes alter incentives, they do influence the size of the economy, and that can have important revenue effects that conventional estimates overlook. In general, because of economic feedbacks, tax cuts that improve productive incentives cost less revenue than convention estimates predict, while tax increases that are anti-growth bring in less revenue than expected. For links to the various parts of his draft proposal, see Senate Finance Committee, Tax Reform Staff Discussion Drafts, http://www.finance.senate.gov/issue/?id=7D222262-D589-4D5E-A2AB-1504273E2E61. For the proposal’s cost recovery sections, see Press Release, Senate Finance Committee, Baucus Works to Overhaul Outdated Tax Code, Nov. 21, 2013, http://www.finance.senate.gov/newsroom/chairman/release/?id=536eefeb-2ae2-453f-af9b-946c305d5c93. For links to Chairman Camp’s draft plan, see Press Release, Committee on Ways and Means, Camp Releases Tax Reform Plan to Strengthen the Economy and Make the Tax Code Simpler, Fairer and Flatter, Feb. 26, 2014, http://waysandmeans.house.gov/news/documentsingle.aspx?DocumentID=370987. The 2010 bill was called the Bipartisan Tax Fairness and Simplification Act of 2010 (S. 3018), and the 2011 bill was called the Bipartisan Tax Fairness and Simplification Act of 2011 (S. 727). For a detailed analysis of the potential growth and revenue effects of the Wyden-Coats bill, see Stephen J. Entin & Michael Schuyler, Economic Consequences of the Wyden-Coats Tax Plan, IRET Policy Bulletin No. 100 (Oct. 28, 2011), http://iret.org/pub/BLTN-100.PDF. Michael Schuyler, Slower Growth through “Tax Reform”: The Baucus Capital Cost Recovery Proposal, Tax Foundation Special Report No. 216 (Mar. 25, 2014), https://taxfoundation.org/article/slower-growth-through-tax-reform-baucus-capital-cost-recovery-proposal. Stephen J. Entin, Michael Schuyler, & William McBride, An Economic Analysis of the Camp Tax Reform Discussion Draft, Tax Foundation Special Report No. 219 (May 14, 2014), https://taxfoundation.org/article/economic-analysis-camp-tax-reform-discussion-draft. For additional information on the Taxes and Growth model, see the appendix. The Baucus plan includes a number of retroactive tax increases. For a discussion of these provisions and an analysis of retroactive tax increases, see Michael Schuyler, Retroactive Taxation and the Baucus Proposal, Tax Foundation Fiscal Fact No. 405 (Dec. 9, 2013), https://taxfoundation.org/article/retroactive-taxation-and-baucus-proposal. See also Scott A. Hodge, The Tax Draft of Sen. Max Baucus Amounts to Legalized Wealth Confiscation, Forbes, Dec. 11, 2013, https://taxfoundation.org/article/forbes-op-ed-scott-hodge-senator-baucuss-tax-reform-proposals. Joint Committee on Taxation, Macroeconomic Analysis of the ‘Tax Reform Act of 2014’, JCX-22-14 (Feb. 26, 2014), at 12, http://waysandmeans.house.gov/UploadedFiles/JCT_Macroeconomic_Analysis_JCX_22_14__022614.pdf. One very broad and technical definition of income, known as Haig-Simons income, does call for economic depreciation. But a fundamental problem with Haig-Simons income is that, like economic depreciation, it is inherently biased against investment and economic growth. For a fuller explanation, see Michael Schuyler, Slower Growth through “Tax Reform”: The Baucus Capital Cost Recovery Proposal, Tax Foundation Special Report No. 216 (Mar. 25, 2014), https://taxfoundation.org/article/slower-growth-through-tax-reform-baucus-capital-cost-recovery-proposal. 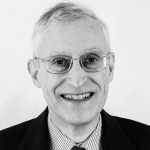 See also Stephen J. Entin, The Tax Treatment of Capital Assets and Its Effect on Growth: Expensing, Depreciation, and the Concept of Cost Recovery in the Tax System, Tax Foundation Background Paper No. 67 (Apr. 24, 2013), https://files.taxfoundation.org/docs/bp67.pdf. Michael Schuyler, Growth Dividend from a Lower Corporate Tax Rate, Tax Foundation Special Report No. 208 (Mar. 12, 2013), https://taxfoundation.org/article/growth-dividend-lower-corporate-tax-rate. Michael Schuyler & Stephen J. Entin, Reduced Tax Rates on Capital Gains and Qualified Dividends, Tax Foundation Fiscal Fact No. 381 (July 31, 2013), https://taxfoundation.org/article/case-study-3-reduced-tax-rates-capital-gains-and-qualified-dividends.